It’s the poster-book image, the flashy, pioneering facade of Valencia which has overtaken all other pictorial references to the city the world across, waving the flag for architectural innovation and groundbreaking artistic grandeur, sweeping the true financial crisis of Spain’s faltering economy beneath its flashy new white reflective surfaces (even though the pure cost of the development undoubtedly punched its own hefty dent in the country’s financial lacuna). 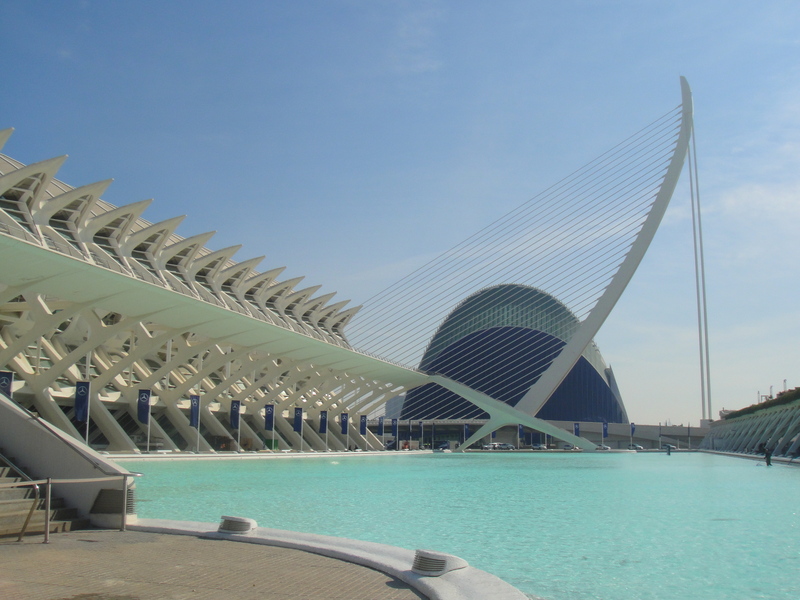 The City of Arts and Sciences (La Ciudad de Las Artes y Las Ciencias) is the 21st century icon of not only Valencia, but also of Spain, a symbol of the country’s progressive cultural stance, leaping ahead of its European neighbours in architectural skill, innovation, and pure bare-faced audacity. 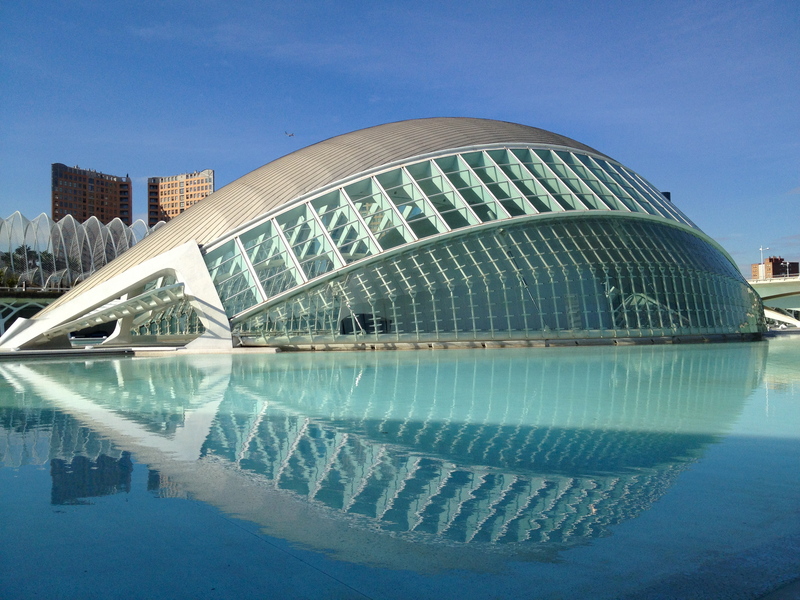 Designed by Valencian-born architect Santiago Calatrava in partnership with Spanish architectural great Felix Candela, the arts and sciences city is a town within a town, a giant complex of architectural spectacles devoted to learning, the arts and science, and set within a glittering azure pool in what was once part of the old Turia river. 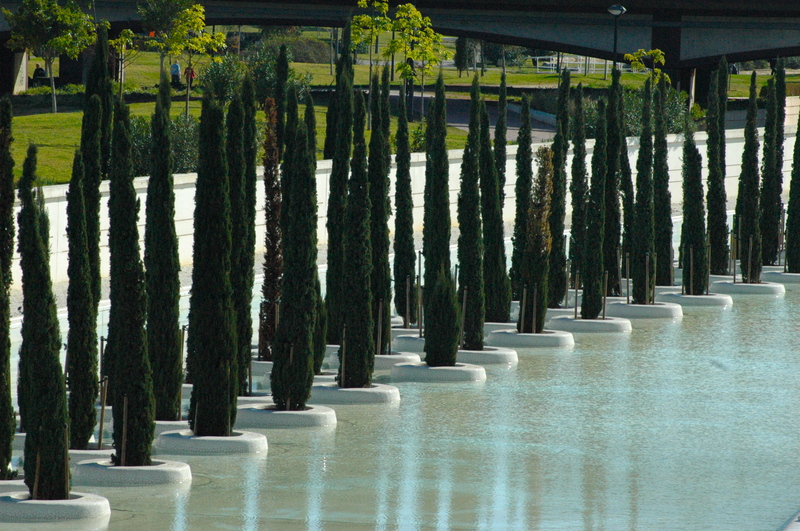 There are some 7 buildings in all, a panoply of differently angled, curved and bombastically arranged shapes in pearly, clean and uninterrupted white, all dappled and reflected by the blues and turquoises of the huge shallow ponds which surround the buildings, and marking a start contrast to the repetitious lines of one cypress tree after another, each neatly trimmed into perfect alignment with the sharply linear and meandering architecture of Calatrava’s creations. Reaching the arts city by bus (bizarrely, despite spending such a stonking amount of money on developing the site, the city is yet to connect it anywhere close to the metro system, and it’s a good 45 minutes walk from the historic centre), we were simply awestruck by the originality and sheer scale and quantity of the architectural feast on show as we drew progressively closer to the complex. 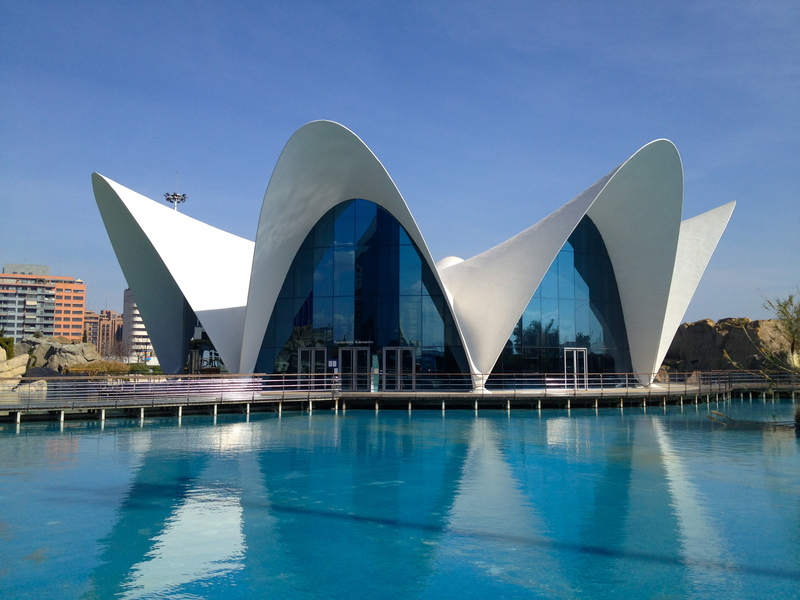 Oohs and aahs simply didn’t cut it when these outlandish buildings emerged before us. 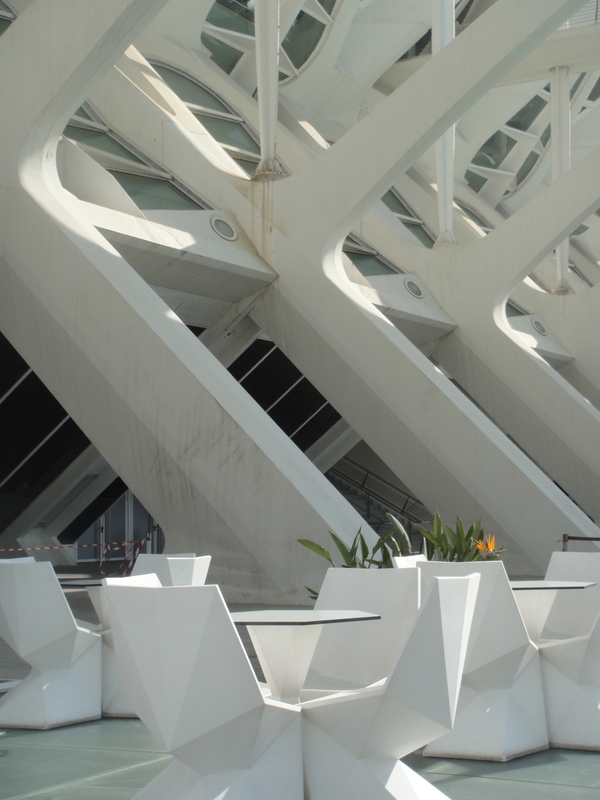 It felt a little like entering the set of a huge futuristic feature-film, the warm Valencian sunshine being in itself like studio lights, reflected as it was off the dazzling white surfaces of these luminescent buildings. Wanting to take in each and every detail of this incredible place, we simple decided to start off at one end and walk to the other, gawping at and admiring each respective architectural masterpiece in turn. 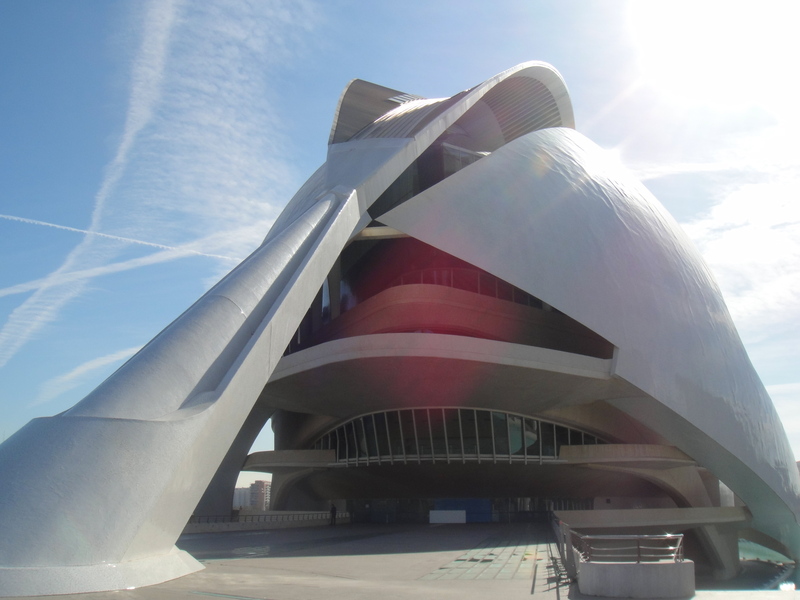 We began at the Palau de les Arts Reina Sofia, an opera house and performing arts center which, with the capacity for 4,400 spectctors is one of the biggest opera houses in the world, second only in size to the Sydney opera house and containing some 4 auditoriums. Surrounded by some 87,000 square metres of landscape and water, and comprising two huge metal shells weighing over 3,000 tons, the building is like a vast space-age helmet, appearing to float suspended above a sea of disinfectant or other chemical mass. 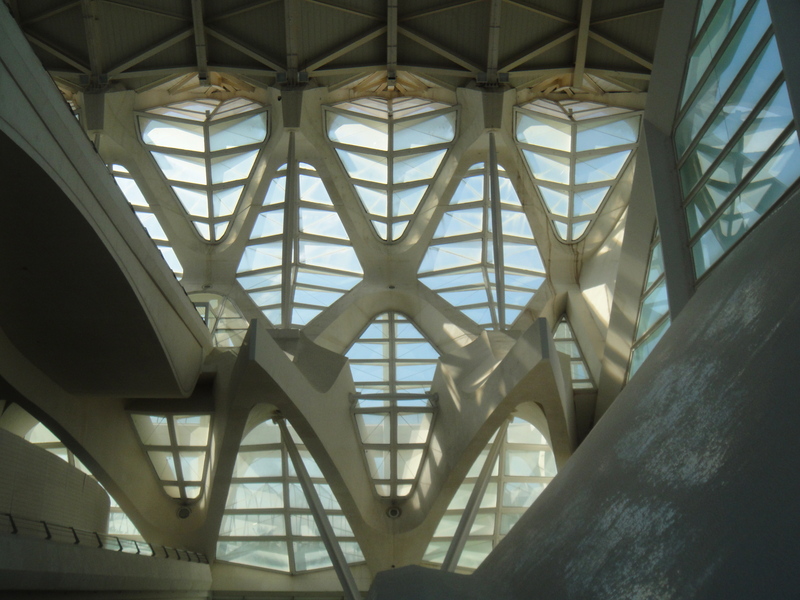 We did however notice that the building, the newest of the complex, is already showing worrying signs of age – the multi-tiled mosaic surface (paying homage to Gaudi) looks as though its cracking and wrinkling all over. Not a good sign for a building which the architect billed some 100million euros for and which cost much, much more to build. 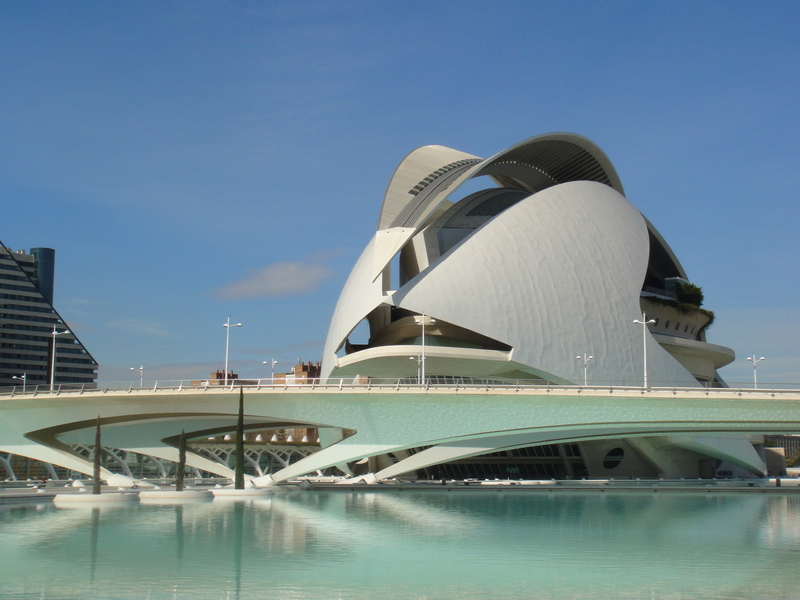 The opera house is separated from the next building, L’Hemisfèric, by a faultless curving bridge which sweeps with ease and elegance across the large watery space, carrying cars from one side of the old river bank to the other. 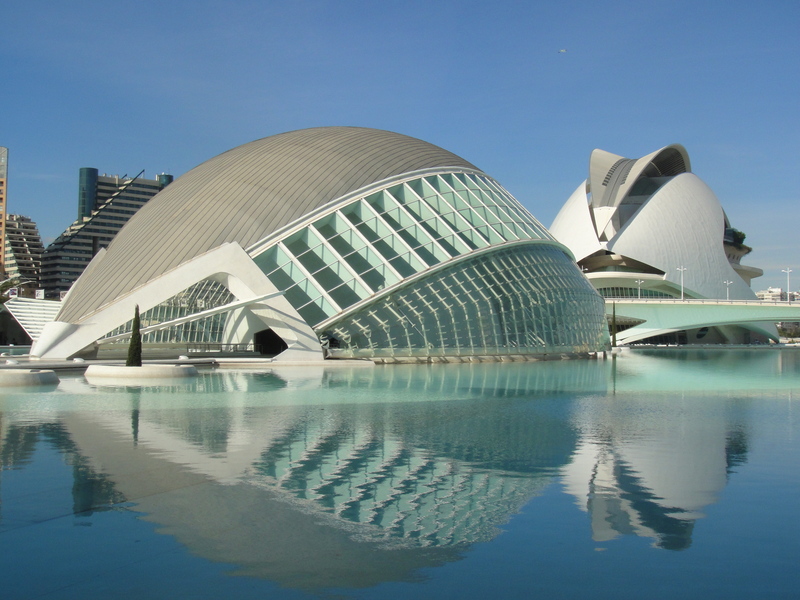 Meanwhile the Hemisferic is a perfectly rounded glass and silver entertainment venue, part Imax, part planetarium and par laserium (whatever that is). 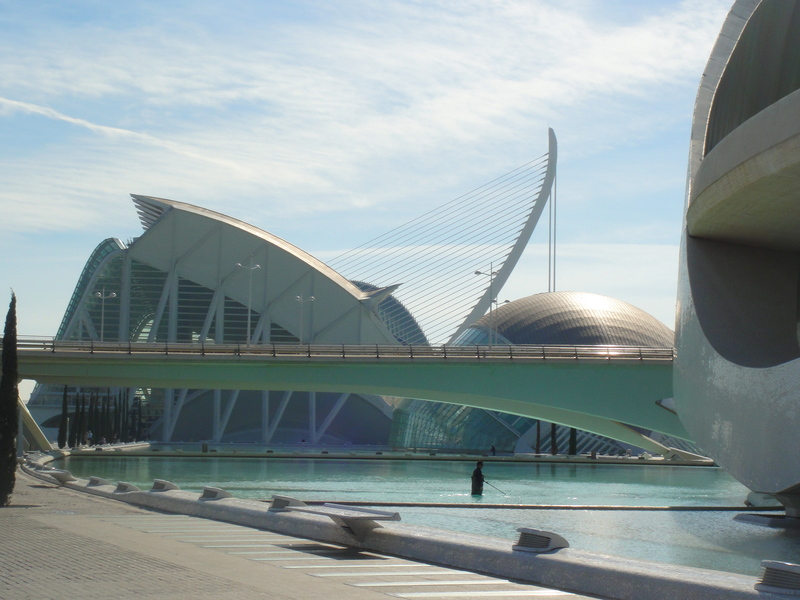 The building is designed to resemble a giant “eye of knowledge”, and when reflected in the watery surrounds makes a perfect oval shape, completing the eye-like illusion. Allegedly the large shutter along its “roof” opens along the curved axis of the “eye” like a large shutter – I wold love to see that in action. 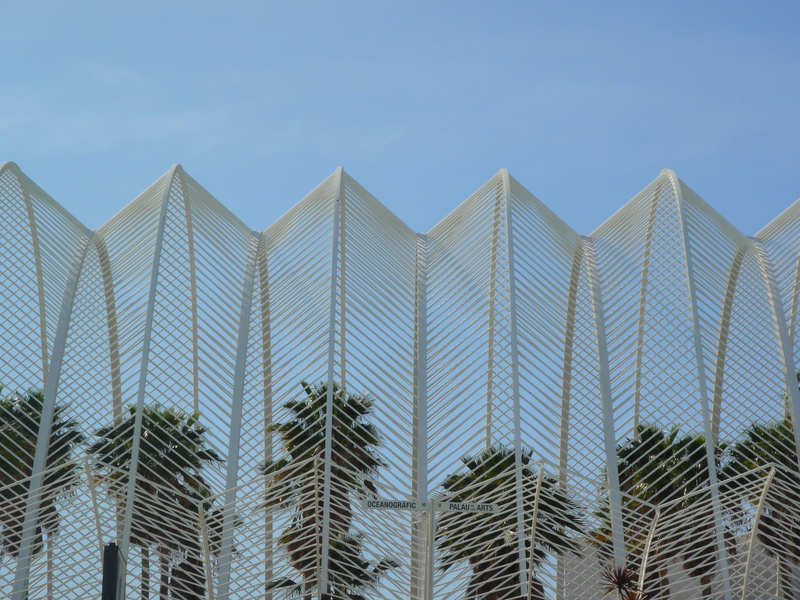 Up next was the vast Museu de les Ciències Príncipe Felipe, an interactive museum of science that is said to resemble the skeleton of a whale, although the spikey diamond shaped window frames reminded me more of a harlequin. 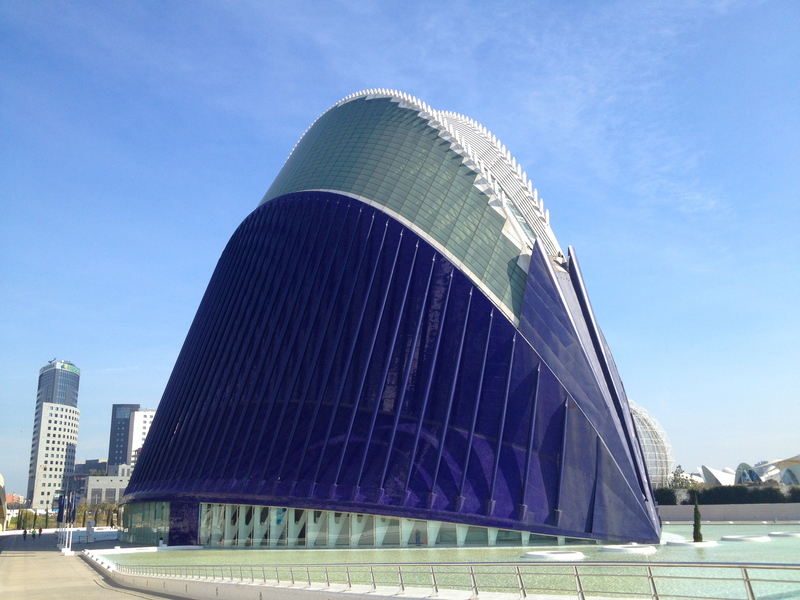 While so many of the buildings in the park were shut to the public, this one was open, and at the cost of only 2 euros extra on top of the vast 22 euros aquarium entrance fee, one could tour around the huge science exhibition in this complex. 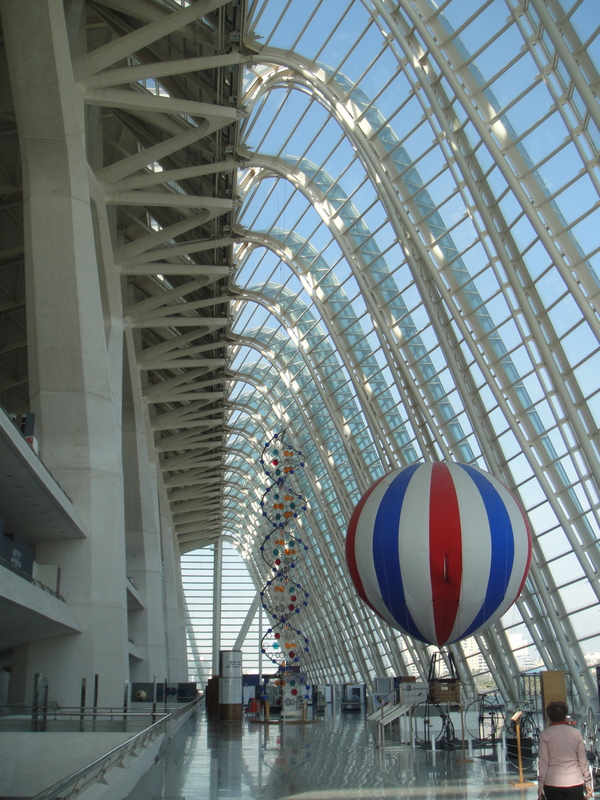 I have to say, I found it all a bit boring and fragmented – there were plenty of self contained little science exhibits which I’m sure would have been of more interesting for school tours following a specific curriculum. Having said this, it was good to marvel at the space – this vast centre is like an airport terminal with so much wasted space – 220 metres long, it comprises 4,000 panes of glass and is also surrounded by it’s own reflective pools which help to magnify the space yet further, and besides which we stopped for a “pick-me-up” expresso sat on equally contemporary looking white angular chairs. 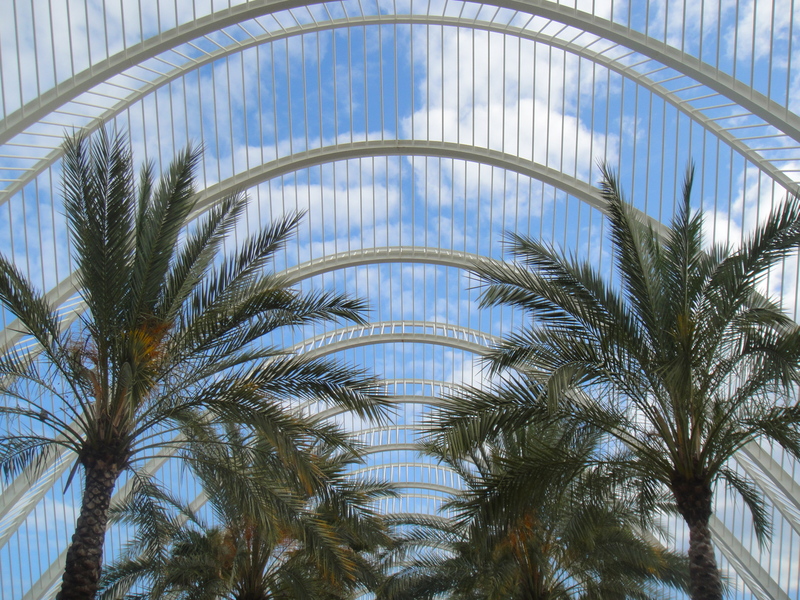 Walking past the science museum one walks either through or under L’Umbracle a feather-resembling landscaped walk way which comprises large super fine archways extending over palms, orange trees, herbs and a plethora of local plant varieties which flourish in this partly protected environment. It amazed me that these tall and slender archways are formed from concrete – they looked so fine and elegant that they appeared feather light, like a hair comb reaching up into the heavens. We were making our way to the vast aquarium complex at the far end of the park, but before reaching it passed two other sites of significant interest. 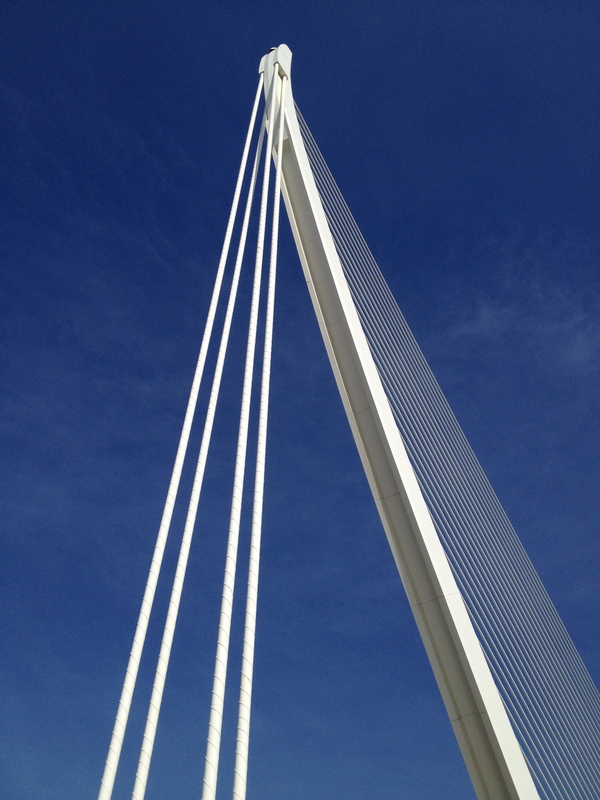 First, Assut d’Or, a suspension bridge so fine and tall that it reaches into the sky like a harp, a ship’s sail, or as some would have it, the “ham slicer”. Beyond that was the only blue building of the white series, L’Àgora looking a bit like a ripening fig. We couldn’t tell what it was from the outside, but apparently it’s a covered plaza in which concerts and sporting events are held – another huge space which, I assume, goes unused for much of the year. 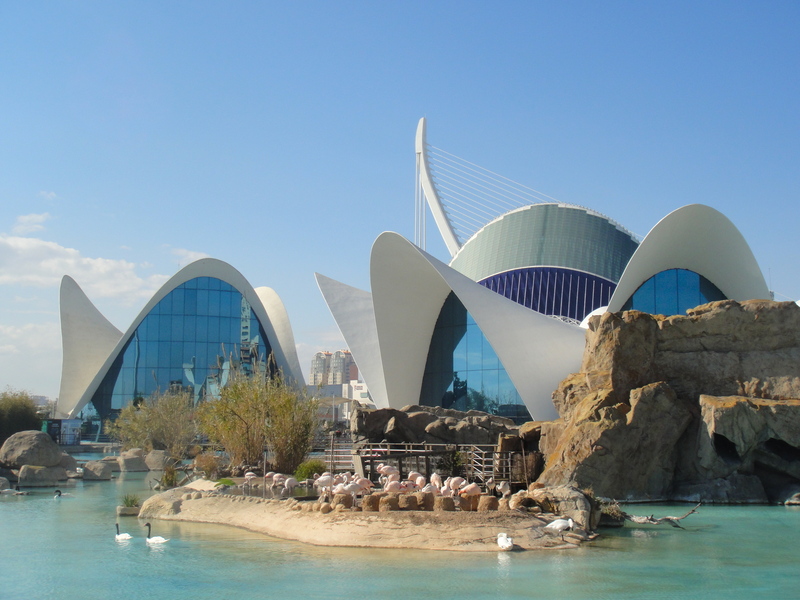 Already pretty exhausted by all we had seen, but still full of enthusiasm for the pure ingenuity and extra-human scale of the site, we finally made it to L’Oceanogràfic, an open-air oceanographic acquarium-come-park, which is the largest aquarium in Europe, and with 110,000 square meters of space, 42 million liters of water, and a number of different buildings representing different aquatic environments from wetlands and tropical seas to antarctic and the pacific, that statistic does not surprise me. 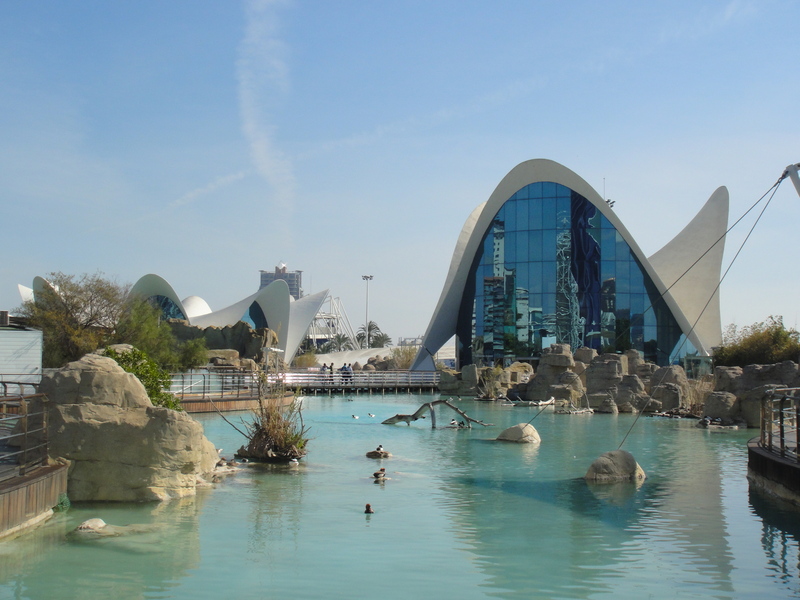 Asides from the incredibly varied array of aquatic species found within the park, it is also notable for having two of my favourite buildings in the whole complex. 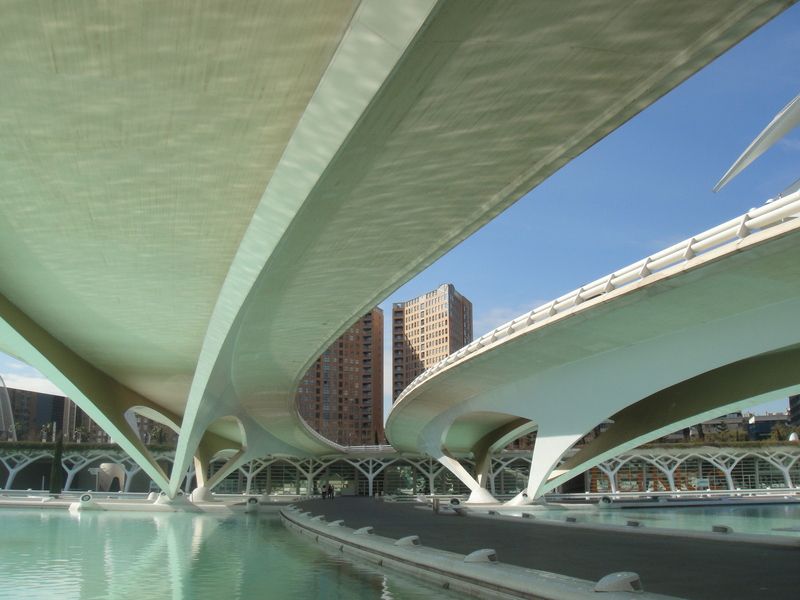 Both by Felix Candela, they were designed to open out from the ponds surrounding them like waterlillies. 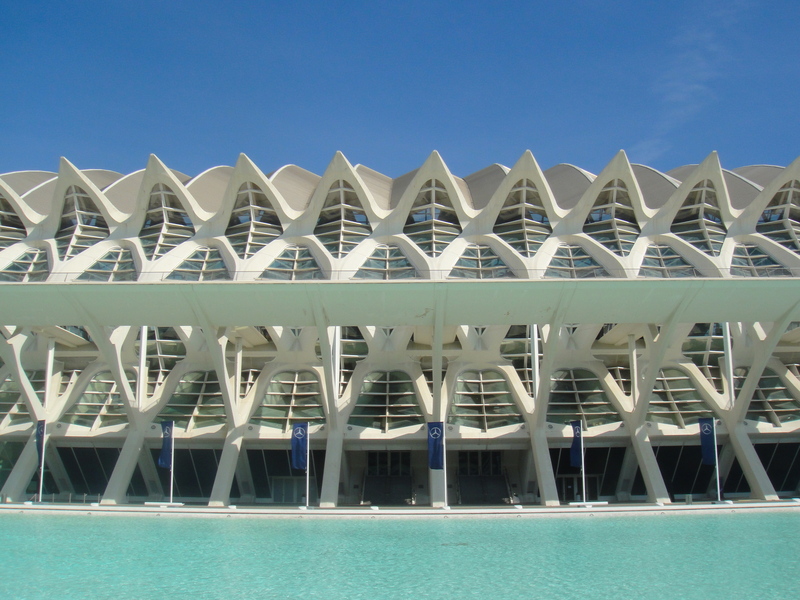 With super thin concrete shells looking almost like bonnets shaped around large reflective glass windows, these buildings are particularly elegant and looked wonderful as the backdrop to the vibrant pink flock of flamingos ambling in shallow waters near by. 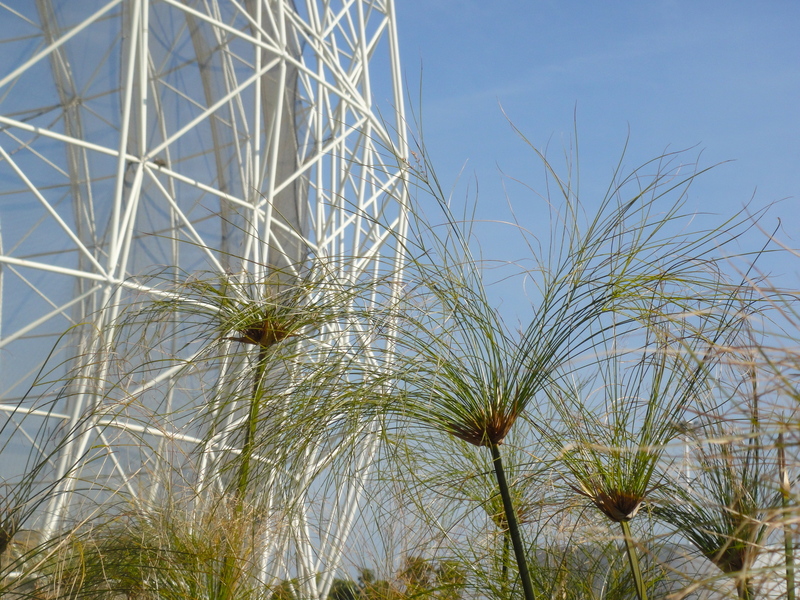 So at the risk of simply writing what is already turning into something of a travel guide into the arts and science city, what was our experience of the park? 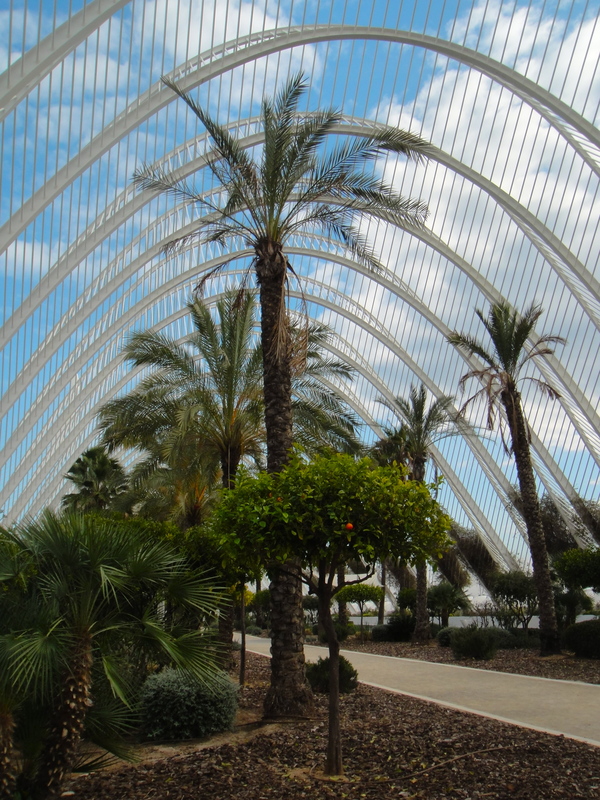 Apart from being frankly overwhelmed by the size, diversity and other-worldliness of the park, it was hard not to explore the complex with a hint of cynicism and a touch of distaste at the sheer scale of the extravagance and expense which must have been poured out by the Valencian government in order to pay for this development. 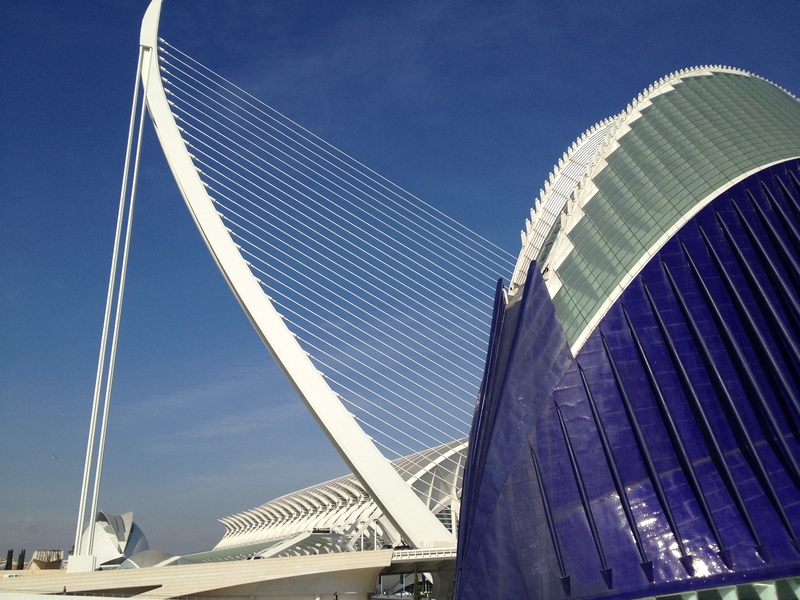 While much of Valencia’s city centre is left to slowly crumble, and prime sites near the Catedral are lying empty, further out in the far suburbs of the city, we have this mammoth arts and science centre which appears to belong to another age. Whether that age was the time of optimism (or perhaps just naivety) when economies across the world felt that credit was limitless and pursued vastly expensive projects recklessly unchecked, or whether it is a futuristic age when architecture such as this will become more commonplace (and cheaper to build), who knows. However for the present the site is dogged by controversy; because for much of the time it is empty, unused and silent; because it costs more to upkeep everyday than it can possibly make from revenues (even when we were there there were several men in every pond cleaning the waters, trimming the cypress trees and polishing the white surfaces), and because the local funds diverted into the project could have helped so many living under financial straits in the Valencia region. Yet there can be no doubting the architectural brilliance of what has been achieved here. 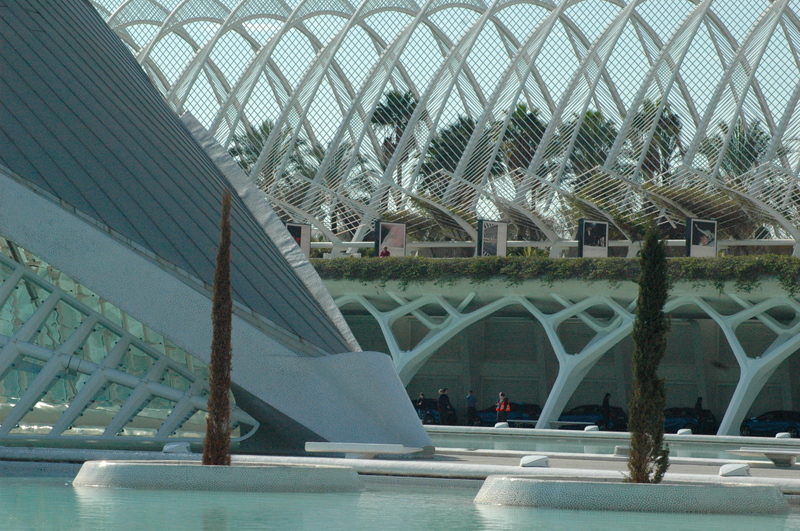 Such is the extreme of experimentation that it marks a vast contrast to the rest of Valencia’s historical centre. And this isn’t the first time I have seen such innovation in Spain – there’s the titanium-tiled fish-like Guggenheim in Bilbao for example, and the meandering Marquez de Riscal winery building in La Rioja, as well as a number of other examples of pioneering architecture cropping up across Spain, architecture so forward and extreme that its almost as though Spain, still damaged by the shadow of its savage civil war only two generations ago, is trying to shake of the past by surging forward. But for now at least, that forward pace is necessarily stunted. The Spanish economy is one of the most precariously shaken in Europe, and the unemployment levels (one third of employable Spaniards are currently unemployed) are probably the worst. 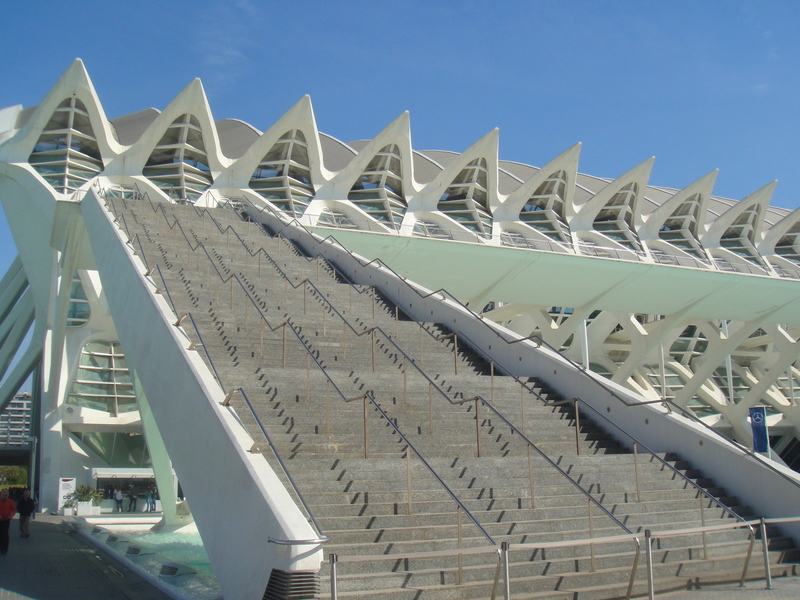 But in these grim times, at least we have masterpieces such as these works by Calatrava and Candela to gaze at in admiration, the manifestation of a crazy dream in a now long-lost time when so many of us were dreamers, untouched by the economic crisis which has now taken an irresolute firmhold across the world. Quite stunning architecture, especially against all that water. Beautiful. I will get there one day!